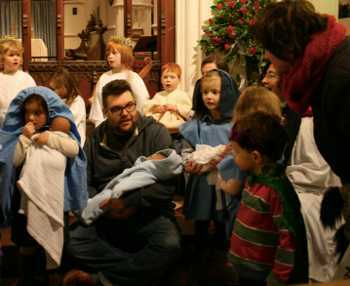 Children and young people are welcome at all our services. There is a children's area in the north transept of St. Vigor's Church, Fulbourn, and at the back of St. Nicholas' Church, Great Wilbraham, for the under 5's. This takes place every Sunday during the 11 a.m. service, in the Sunday school rooms within St. Vigor’s . They are led by our Parish Assistant and a team of volunteers. Crafts, toys, stories and songs. £1.50 per adult and child. All welcome. Happy Sad Club on Thursdays at Great Wilbraham Primary School. Happy Sad Club offers a safe space for the children from Great Wilbraham Primary School to share what is going on in their lives. This is run with the PSHE Coordinator (Personal Social and Health Education). Topics the children share and in which they support each other include bereavement, illness in the family, divorce, health, bullying and managing anger. Lots of happy things are shared too. The clergy and members from our churches run regular assemblies and school services at Fulbourn Primary School and Great Wilbraham Primary School. Various special events are held during the year, for example an 'All Saints Party'. We also run craft mornings and special events to celebrate major Christian festivals. The Churches of St Vigor's, St Nicholas' and St John's are committed to protecting children, young people and vulnerable adults in our congregations. We have a Child Protection Policy in place which is written in accordance with current proceedures and guidelines and is reviewed annually by the PCCs. All those who help with young people or vulnerable people in our Parishes are asked to complete a Criminal Records Bureau check, give two personal referees who will vouch for their character and read and sign our Child Protection Policy (for those working with under 18's).